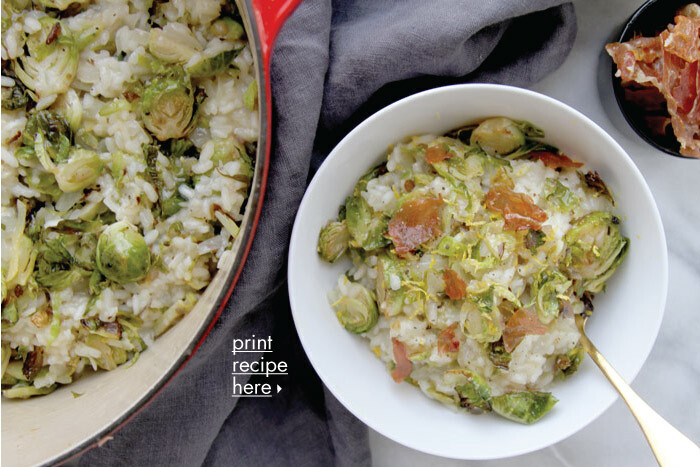 You’ll love this risotto that features nicely roasted Brussels sprouts, bright lemon flavors, all topped with crispy and salty prosciutto. Both the juice and zest of the lemon are used in this dish, lending its distinctive flavor that pairs especially well with the caramelized Brussels sprouts. The crisped prosciutto tops it all off to perfection. Crispy bacon would be a tasty substitute for the prosciutto. 1. Preheat the oven to 400° F. In a medium bowl, mix the prepped Brussels sprouts with the diced shallot, 3 tablespoons of olive oil, 1 tablespoon lemon juice, salt and pepper. Spread the coated Brussels sprouts on a roasting pan and bake for 20 minutes or until just browning begins to occur; stir and toss halfway through the roasting time. 2. While the Brussels sprouts roast, pan fry the prosciutto in a sauté pan until crispy; set aside. 3. In a large Dutch oven, sauté the onions, garlic, and lemon twist strips in 2 tablespoons butter and 2 tablespoons olive oil over medium-high heat until the onions become translucent. Add the rice and stir until coated. Add the wine and continue to stir until all the liquid is absorbed. 4. Meanwhile, in a separate soup pot, bring the vegetable stock to a simmer. 5. Once the wine has been absorbed into the rice, slowly add 1-2 ladles of stock to the pot of rice and bring to a simmer. Keep simmering and slowly add ladles of broth, one ladle at a time. Stir continuously, until all of the stock is absorbed. 6. Add the salt and pepper while stirring and adding the stock. Taste test the risotto often to ensure adequate salt and pepper according to your taste. When the risotto is al dente, add 1 more ladle of the stock, stir, and turn the heat to low. 8. Serve hot. Garnish with lemon zest, crispy prosciutto and additional Brussel sprouts on top.